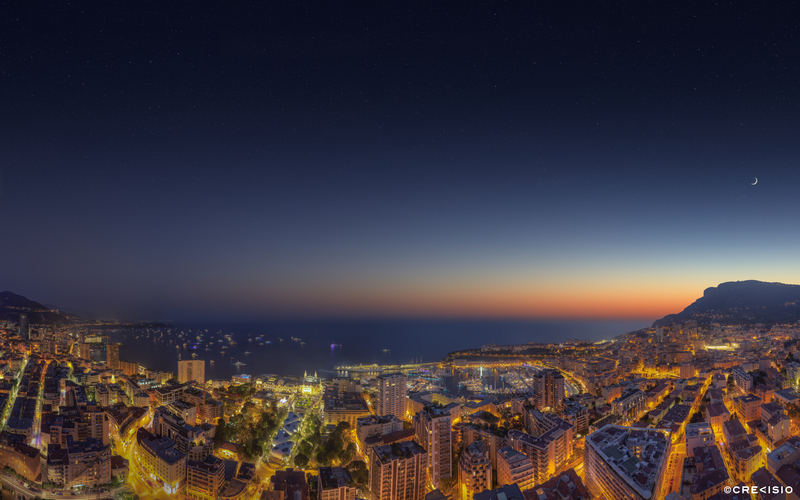 Ultra high resolution panorama of the Monaco Yacht Show Sunset 2014 in the Principality of Monaco during twilight and a clear starry night sky and new moon. This photograph was taken after sunset from (now) the second tallest building in Monaco, Le Millefiori (at equal height with La Tour Annonciade), from the 37th floor. This ultra high resolution photograph has a full resolution of 465 megapixel (27,297 x 17,060 pixels, at 300 dpi). Download the high resolution wallpaper for personal use (scaled to 10,240 x 6,400 pixel) by clicking on the image above or by following the download links below. For commercial use, please contact Crevisio.